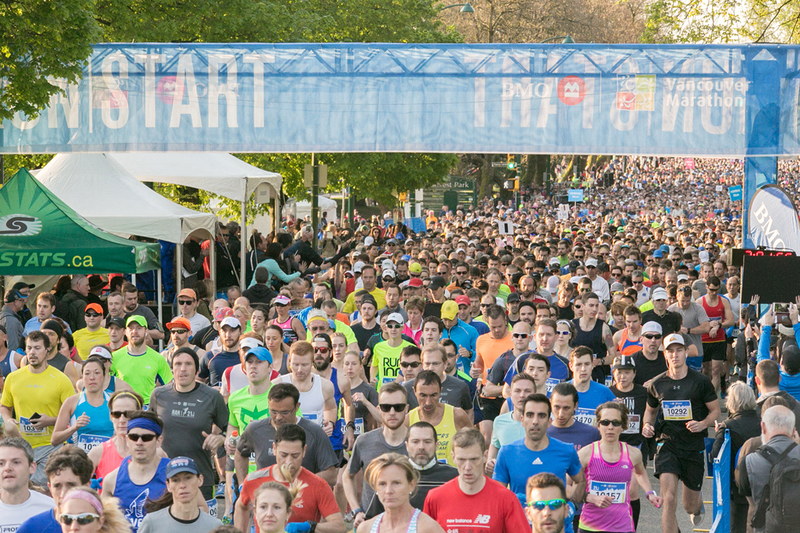 Vancouver, BC – May 7, 2015 – Nearly 15,000 runners from more than 50 countries took part in this year’s BMO Vancouver Marathon, new Marathon Relay, Half Marathon, 8KM races and Kids Fun Run. In addition, media from afar traveled to Vancouver to cover the world-class event including outlets from Italy, China and Japan. “Thank you everyone again for coming and being a part of this longstanding event in Vancouver,” shares Charlene Krepiakevich, Executive Director of the Vancouver International Marathon Society, noting the excitement in the air is palpable once the event banners go up on the Burrard and Cambie Street Bridges before the annual event in May. Great stories on the sunny race day included amazing crowds for Start Lines and throughout the courses that span nearly 70KM of Vancouver roads, local runner Stephen Sanderson running in full firefighter gear, a local RunVan Ambassador, Neil Wakelin running his 150th Marathon as part of the Legacy Runners Club that has over 100 members who have participated in 15 Vancouver Marathon events or more, and two marriage proposals at the Finish Line. The event also makes a positive social impact with its Run4Hope program which involved 31 charities and nearly 600 charity runners in 2015, helping to raise over $13 million for charity over the past decade. To top it off, the event has achieved an overall waste diversion rate of 97% at the event’s finish area – the highest the BMO Vancouver Marathon has seen to date. In addition, the Salvation Army took nearly a tonne of clothing and Quest Food Exchange took a large amount of the uneaten food for donation. Organized by the Vancouver International Marathon Society, the non-profit organization relies on 4,000 volunteers and 150 medical volunteers to help make the event a success. On course, nearly 30 aid stations provided runners with 31,000 liters of water as runners made their way through 12 Neighbourhoods. In addition, 32 Entertainment Stations also welcomed runners with great tunes and entertainment. Furthermore, event organizers hosted a free, three-day Health, Sports & Lifestyle Expo at the waterfront Vancouver Convention Centre West Thursday through Saturday, plus a Finish Line Street Festival on West Hastings Street that was bumping with energy as runners crossed the Finish Line in-front of great crowds on Sunday. Runners from more than 50 countries ran the 44th BMO Vancouver Marathon, in an event that CNN and Forbes Magazine have respectively ranked as one of the World’s Most Exotic Marathons and a Top 10 Destination Marathon in the World. With an increase in prize money for Elite Athletes this year, fans also saw some great race times including wins by local Rob Watson in the Half Marathon (1:04:48) and Canadian Master’s record holder Lioudmila Kortchaguina in the women’s Marathon (2:37:37). “We’re proud to serve the community while striving to improve the quality of the race experience, grow the sport of running, engage our neighbourhoods in the love of sport, and improve the health outcomes of our communities,” adds Krepiakevich. Winners of the new Neighbourhood Challenge presented by Chevron will be announced in the coming days, rewarding fans who got out on race day and cheered on all of the athletes. See more stories and pictures on the BMO Vancouver Marathon’s official blog.